EUROPE: Recent updates from three projects in Germany and confirmation Siemens will supply the 309MW Rentel project in Belgium. Monopiles finished: Installation of foundations has been completed at Nordsee One, six weeks ahead of schedule. All 54 monopiles had already been fitted with transition pieces. The installation work took four months to complete. Installation specialist GeoSea deployed the Innovation vessel at the North Sea project site, 40km north of Germany, working out of Cuxhaven Port. The 332MW Nordsee One project is being developed by Northland Power (85% ownership) and RWE International (15%) and is due for completion in 2017. With foundations installed, inter-array cables installation is set to commence at Nordsee One. Substation ready: Bladt Industries loaded out Sandbank's offshore substation and its jacket foundation on 15 and 16 April in Aalborg, Denmark. Its journey to the project site began on 20 April. 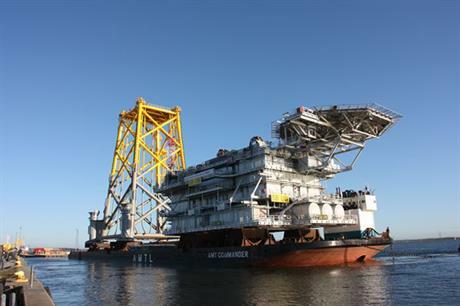 The infrastructure is destined for the 288MW project site in the German North Sea, to the west of Sylt. Confirmed order: Rentel NV has contracted Siemens to supply and install 42 SWT-7.0-154 turbines at its Belgian North Sea project. The turbines will feature a 'power boost' option, raising the wind farm's capacity from 294MW to 309MW. The deal also includes a 17-year service and maintenance agreement – two years longer than had previously been announced when Siemens was named preferred supplier in October. Production figures: Global Tech I's cumulative output topped the 1TWh mark in early April 2016, having begun operations in summer 2015. In January 2016 alone, the 400MW wind farm delivered over 150GWh.